We continued our Historic Pentecostal Revival Tour in celebration of the 90th anniversary of the First Bulgarian Pentecostal Revival with the Church Leadership Summit in Silistra – an event that has been in prayerful planning for almost two years now. It involved a day of leadership training for the pastors and workers of all churches in the Silistra region. Silistra – is a port city of northeastern Bulgaria, lying on the southern bank of the lower Danube at the country’s border with Romania. The town is a major cultural, industrial, transportation and educational center with many historical landmarks including a Roman port, remains of the Medieval fortress and a Turkish Ottoman fort. But our purpose there was not religious tourism, but rather to bring valued principles of church leadership and growth to the heart of this major educational center of north-eastern Bulgaria. The training took place all day on Saturday with breaks in between for fellowship and discussion. We started the morning sessions with an introduction to the subject of Church Leadership and Team Work, while the afternoon brought in a major way the lecture of Structuring the Church for Growth with a review and consecutive discussion groups. It was well received and time for questions at the end was very inviting. As always, it was encouraging to watch church leaders from various denominational groups and religious backgrounds opening for learning and change, while engaging in a healthy dialogue together. 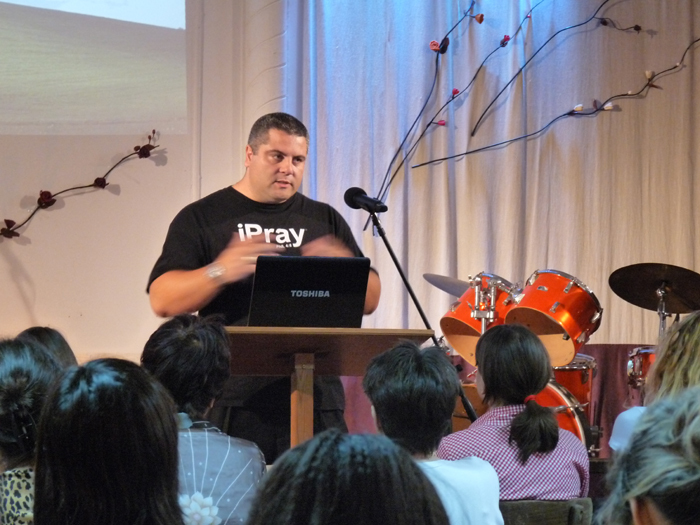 Many inquiries regarded concerns of motivation which lead to an invitation to return and hold another training event specifically on the subject of Internal Motivation within Church Leadership. Then in the Sunday service, we brought a message on the Last Day Prophecies. The trip was also very important to our ministry, as last time when we were in Silistra six years ago we signed the contract for publishing the New Bulgarian Translation of the Bible beginning with Gospel of John. It was a great joy and even greater blessing to be back and meet with our friends at Eagle Publishers. There, we discussed recent and future projects as well as new ministry opportunities in light of their new technological capabilities. We hope to partner together on several projects including a 140th anniversary of the first Bulgarian Bible of 1871, the new translation of the Gospel of Mark, our research essays on Bulgarian Protestant history and of course the long awaited Sunday School project for the Church of God. We were able to pick up several containers of Christian materials including our new translation of Matthew, which will be given to the participants at our 2011 Ministry Camp in July. While in Silistra, we also received a special invitation to view the art gallery of one lady from the church. Her husband and she spent over 40 years painting Christian oriented murals, portraits and so forth, which have been preserved over these years and put on display. With every piece came a story and the story will continue to live on for years to come. After the morning service on Sunday we left immediately and traveled to the old Bulgarian capital city of Veliko Tarnovo where we ministered to the newly formed Bulgarian Church of God congregation there. Although still relatively small in numbers, they have grown in size since our previous fellowship together last year, moving from home group meetings to a rented conference room in the city center. Regional Bishop, Pastor Vassil Petrov, shared with us of their search for a new method of ministry in which we were able to offer some suggestions for such transformation. From there we traveled to Gabrovo where we where able to further fellowship in the regional bishop’s meeting. Late Monday morning we traveled to Kuzanluk where the first Baptist church in Bulgaria was established in the 19th century and where some of the first baptisms with the Holy Spirit in Bulgaria occurred in the early 1920s. We were able to inspect the ongoing church renovation there while meeting with leaders of various churches. Please keep us in your prayers as our journey is long and the days are but few here in Bulgaria. Yet the reward of the ministry is great and the satisfaction makes things easier watching this great nation awaking for a revival with God once again. We have noticed great spiritual change since we returned with the effects of the economic crises here. And with over 400 miles driven, 4 days traveled, 5 lectures delivered, 2 sermons preached in this part of our commemorative Pentecostal Tour, you still cannot put a price on the salvation of a human soul. Go to the ends of the world to preach the Gospel is still the command. Whatever the cost.